FBI firearms background checks, as adjusted by the NSSF, were down 12.8 percent in February to 1.11 million, a decrease of 12.8 percent compared to the February 2018 NSSF-adjusted NICS figure of 1.27 million. Background checks had improved 3.4 percent in January, the first year-over-year improvement since March 2018. That gain followed NICS checks of negative 7.8 percent in December, and negative 9.9 percent in November. Retail Calendar Q4 NICS checks are down 5.9 percent, compared to negative 9.0 percent in Q318. For comparison, the unadjusted January 2019 FBI NICS figure 2.15 million reflects a 7.7 percent increase from the unadjusted FBI NICS figure of 2.0 million in January 2018. 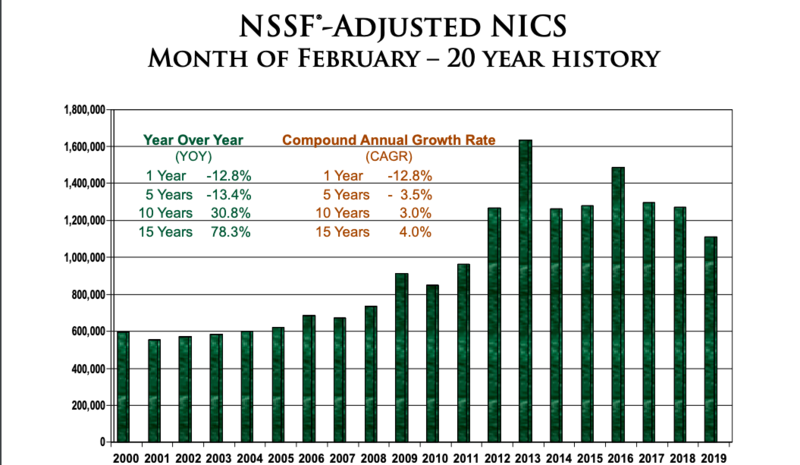 For comparison, the unadjusted February 2019 FBI NICS figure 2.03 million reflects an 11.5 percent decrease from the unadjusted FBI NICS figure of 2.29 million in February 2018.